This was a project I worked on as part of one of my graduate courses – COM 597: Multi-Platform Content Strategy. The U.S. Coast Guard is one of the five armed forces of the United States and the only military branch to fall under the Department of Homeland Security. The U.S. Coast Guard has a rich heritage dating back to the establishment of the U.S. Revenue Cutter Service in 1790. They safeguard our maritime interests and environmental concerns both domestically and internationally. The U.S. Coast Guard lives by the core values of Honor, Respect and Devotion to Duty. They are Semper Paratus – always ready. Their website hasn’t been a high priority until recently. In 2012, President Barack Obama installed the Digital Government Strategy—a comprehensive government-wide strategy to revamp government websites to current standards to deliver better services to the American people. Under the new requirements, the the US Coast Guard now has to update their website. Unfortunately the U.S. Coast Guard is faced with a multitude of problems stemming from their lack of funding – one of them being their website(s), which have been highly neglected. In doing this project, it became apparent that few people know what the U.S. Coast Guard is, what they do and therefore, why they should receive adequate funding. 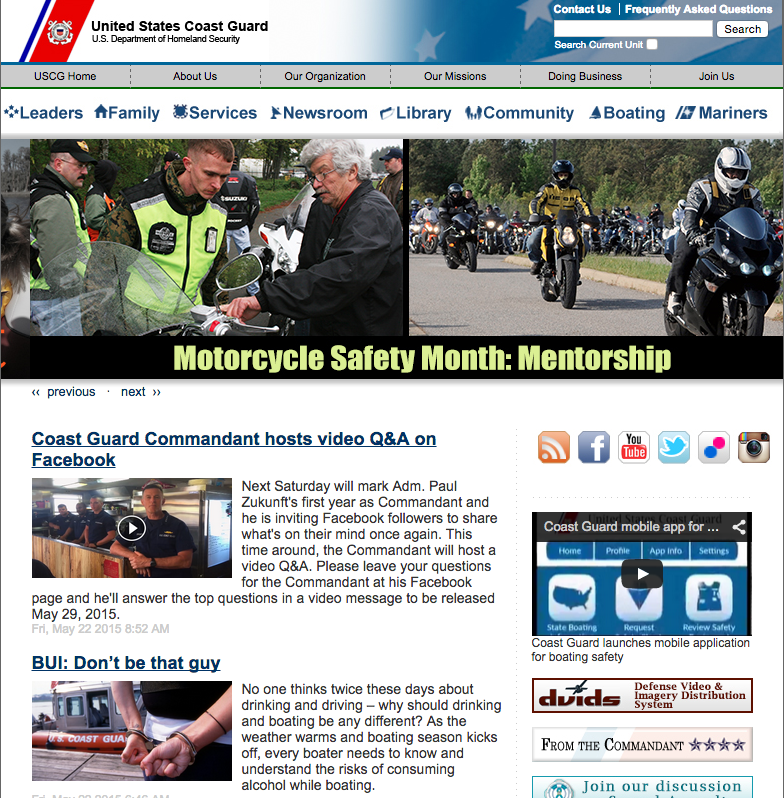 This content strategy was designed to help the United States Coast Guard fulfill the requirements set forth by the Digital Government Strategy. It will also help them increase public awareness, engagement and support of the military branch. U.S. Coast Guard Homepage www.uscg.mil In its current state, uscg.mil serves as a hub for information and resources pertaining to the general public, media, active duty, reservists, auxiliary, retired members, dependents, civilian employees and contractors. U.S. Coast Guard Newsroom www.uscgnews.com The U.S. Coast Guard’s official media relations site. The content audit encompassed mostly qualitative factors, as the USCG wasn’t able to provide any key metrics beyond their monthly Google Analytics reports (a FOIA requirement). It was also immediately apparent that the US Coast Guard’s brand messaging and voice differed significantly from platform to platform. USCG.mil’s Google Analytics report only reinforced these findings. According to their Feb 2015 report, their 404 page was one of the most popular pages. A successful content strategy is dependent on fulfilling both the goals of the target audience and those of the business. In communication with the client, it was clear that they wanted to market to the general public—”civilians” in Coast Guard terminology. But beyond the general public, they didn’t have any clear picture of who they were trying to reach. 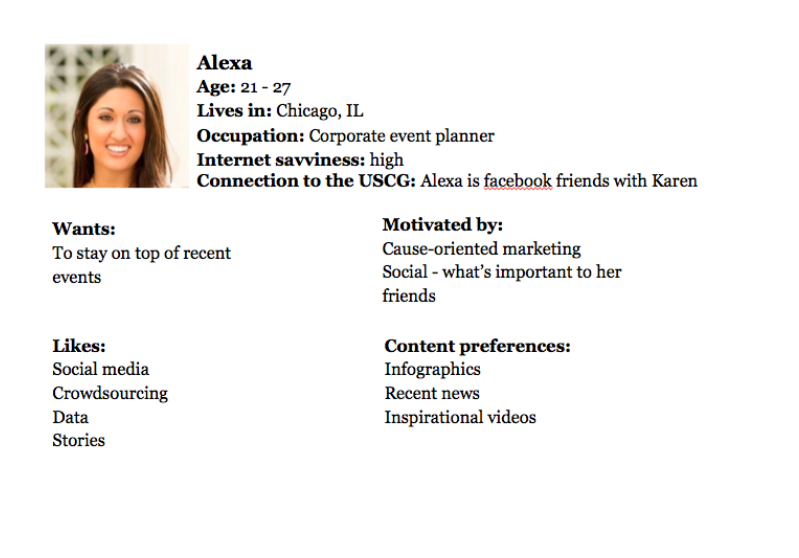 Working with available resources, I tried to narrow down the scope of the general public and from this created three “general” audience personas. 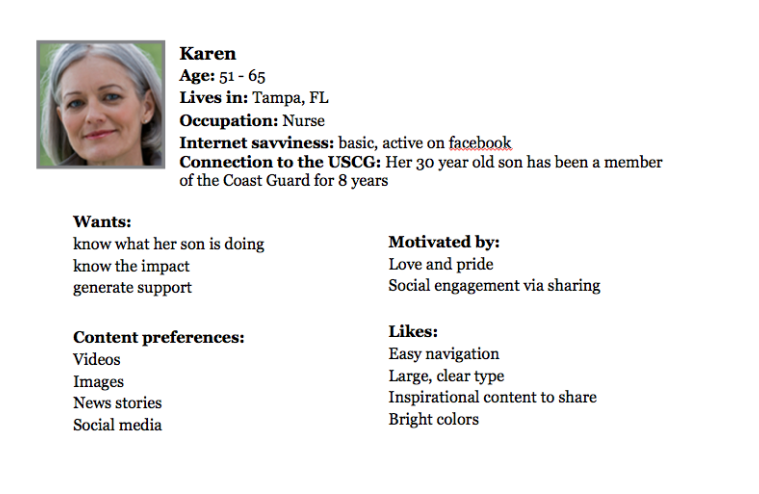 Karen is a member of the USCG’s primary target audience, as she has a direct connection to someone in the US Coast Guard. 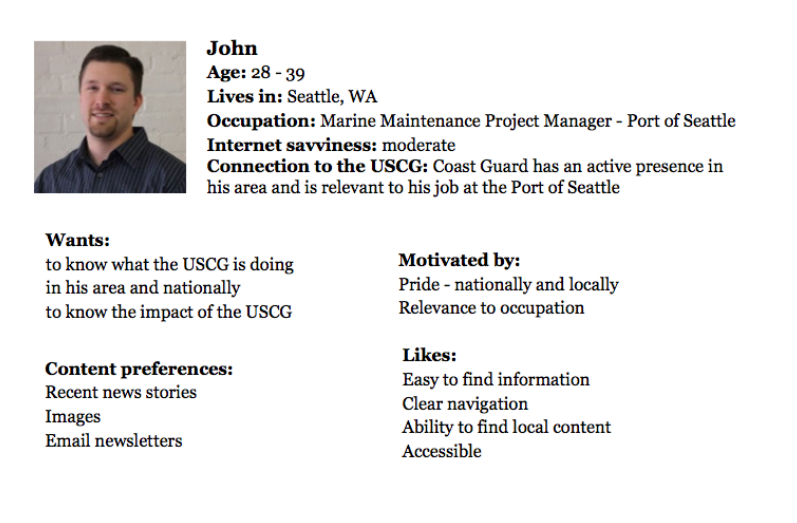 John is part of the USCG’s secondary target audience, as he works in a field and lives in an area that is affected by the US Coast Guard. The new U.S. Coast Guard website will build awareness, engagement and support of the military branch through being a rich resource of stories and information about the U.S. Coast Guard’s history, missions and recent activities. 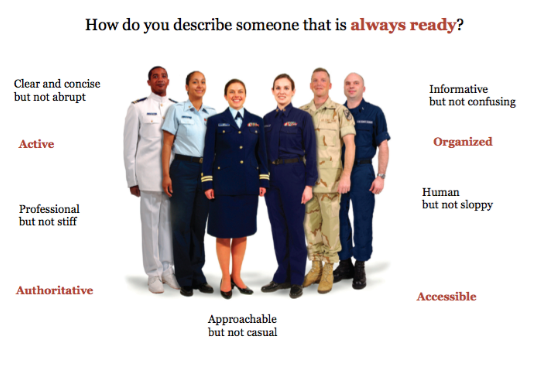 In order to do this, the USCG should develop a unified brand messaging hierarchy, along with voice and style guidelines. They should then remove or revise most of content that is on USCG.mil and other websites and platforms, in order to resonate with their target audience of civilians. Who is the US Coast Guard? Why do they need support? What’s the best way to do this? Because an approachable voice and tone is a crucial element in connecting with a civilian audience, it’s important that the US Coast Guard voice is clear and non-technical. Additionally, by positioning their brand around the values of “Semper Paratus,” their unique motto that means “always ready,” the US Coast Guard will be able to differentiate their brand from the other military branches. It also gives them a familiar framework with which to proceed with these changes. The overall content and design will be regulated by the Office of Public Affairs and the Digital Media Officer. They will ultimately be responsible for monitoring the various platforms and content to ensure they align with brand regulations. Units will continue to create and manage their individual pages but will abide by the content guidelines and update regularly to support a unified online Coast Guard presence and uphold the mandated Digital Government Strategy. New content will be generated by the Office of Public Affairs and the Digital Media Officer. The USCG should also capitalize on the talents and knowledge of its internal community and encourage submissions for content. Creating a content brief and story templates will provide guidelines for those who are interested in contributing. These items will also ensure that contributors provide necessary information that can help ease production time and align brand formatting. All content will be funneled through the Digital Media Officer, who will review and decide if it is applicable to objectives and Coast Guard brand, using a content quality checklist, along with the brand and style guidelines. They may decide to pass the content along to leadership to determine eligibility and relevance. If moving forward, the Digital Media Officer will work with the author to revise content to meet quality guidelines. The guidelines act as a final review step to keep all content high-quality and unified with language, voice and tone. Content will be built in the Content Management System (CMS) published, and promoted on the appropriate social media sites with a regular cadence. To complete the workflow, the Digital Media Officer will notify the content author/contributor and other key influencers. This may include leadership, local public affairs offices, and relevant sub-committees. Finally, the Digital Media Officer will be responsible for a bi-annual content audit to ensure the website content is kept up to date and meets current standards. USCG Newsroom and USCG Compass will be consolidated into USCG.mil, which will serve as the primary source of information. Content will be distributed via a responsive and device agnostic website. 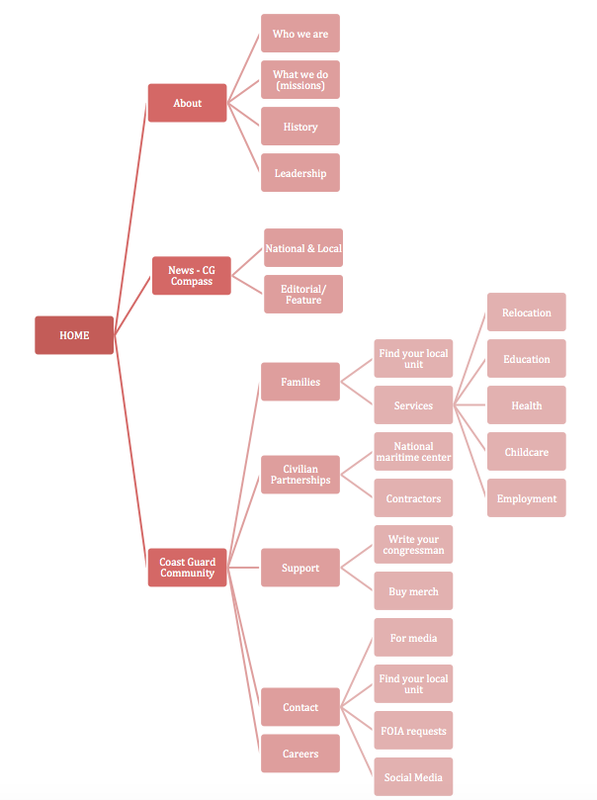 Through topic mapping and keeping our personas in mind, I proposed a more streamlined structure for the new uscg.mil website. The success of the content will be measured based on KPIs and content goals centered on the strategic objectives of awareness, engagement and advocacy. 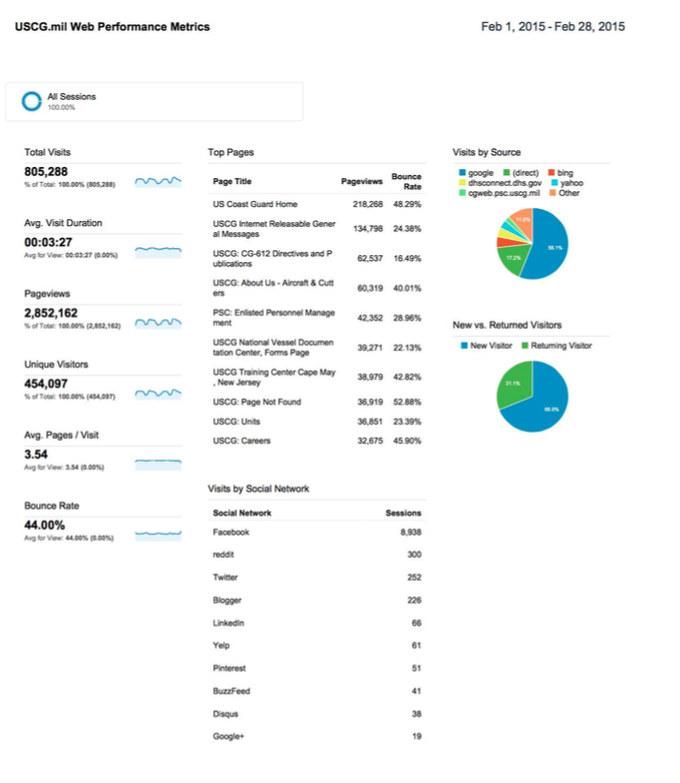 The measurements include Google Analytics, along with basic social media metrics.